The online marketplace wants to secure a niche place in the market dominated by larger firms. THE SCENE FOR online food delivery in Ireland has changed drastically in recent years with the arrival of Deliveroo and most recently Uber Eats. Along with Just Eat, this big three have dominated the space – but there are smaller players active beneath the surface like Dublin-based Marvin that are trying to carve out their own slice of the market. Launched in 2015, co-founder James Galvin admits that Marvin has kept a fairly low profile compared to its multinational competitors. Now with increasing competition from big names, he says he has to get a “lot more tactical” in his efforts. Marvin, which is part of the Hungry group that also has operations in Denmark, runs a similar model to Just Eat where restaurants can list their food for online ordering with delivery carried out by the outlet’s own fleet. It actually beat Deliveroo to the punch by launching in Ireland just before the on-demand food delivery food giant arrived here in 2015. “There was always the threat of a third-party delivery company coming in and trying to shake the market,” says Galvin, who is the former managing director of Just Eat in Ireland. He says he knew that competition would inevitably force Marvin to rejig its strategies while trying to stay true to its original aims. “In terms of us being probably the least well-known within the marketplace, we don’t react to everything that our competitors do, mainly for a few reasons,” he says. That hasn’t stopped the rise of on-demand delivery though. In November of last year, Deliveroo’s direct rival Uber Eats rocked into town, heating up competition between the companies. Just Eat has been active in Ireland for over a decade, mostly operating its food delivery booking system for restaurants that have their own fleets, but it has been rolling out its own network of riders too. The UK-headquartered company recently reported a 43% bump in revenues in 2018 to £779.5 million – with pre-tax profits of £101.7 million – and it expects to surpass the billion-pound sales mark in 2019. Marvin doesn’t have these same deep pockets as the other players so it must “choose (its) battles a lot more wisely”, Galvin says. The company, he says, can be choosy about what areas it launches in and with what restaurants. “There are spots around the country that we definitely have much more brand recognition in than other spots. That’s deliberate because we’ve targeted those areas specifically for tactical reasons. We believe that they’re easier battles for us,” he says. Originally Marvin had a “scattergun approach” of trying to sign up as many restaurants as possible. Galvin adds that the next hurdle for the company is improving its brand recognition among customers. Without disclosing the exact number of Marvin users, Galvin says there are hundreds of thousands of accounts at various levels of activity. Despite the seeming dominance of food delivery’s big three, there are some Irish firms trying to take a small slice of that pie. One startup, Delivery Tab, is trying its hand at on-demand delivery with cyclists deployed on the streets. On the other side of that coin, Flipdish – which recently raised €4.8 million – builds a software platform to help restaurants and takeaways build their own apps to avoid using marketplaces like Just Eat and Marvin entirely. 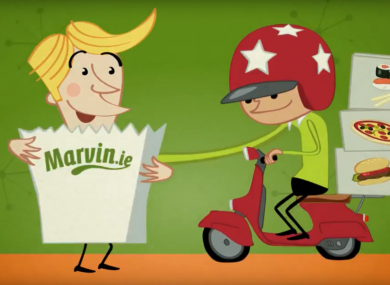 Marvin only works with restaurants that have their own means of getting grub from A to B and Galvin can’t see the company ever giving into supplying delivery riders. “Our average commission rate is around 8% for restaurants,” he says. That contrasts with Just Eat’s marketplace percentage, without delivery, of around 13%. Deliveroo and Uber Eats have commissions in the regions of 20% to 30% for their delivery services. “Our full (unique selling point) in the marketplace is about value. My theory is that if were to try and compete with the third-party delivery companies, we couldn’t offer the same level of value that we do today,” Galvin says. Email “Why 'under-the-radar' Marvin wants to become the number-two food delivery choice”. Feedback on “Why 'under-the-radar' Marvin wants to become the number-two food delivery choice”.